I have, on occasion, referred to this book by the wrong title, A Collapse of Horrors rather than A Collapse of Horses. I imagine the slip perhaps resulting from the proliferation of different aesthetics and styles of horror that Brian Evenson so skillfully weaves together in his newest short story collection. Brian Evenson is one of the most eclectic authors in the contemporary landscape—he shifts between literary minimalism, horror, sci-fi, noir, and dark humor with ease, and depending on the book, he is equally likely to be invoking continental philosophy as he is to be writing the novelization of the video game Halo (though his works that lie firmly in the realm of genre tend to be written under his pseudonym BK Evenson). This collection is his 15th full-length work of fiction, in addition to two books of nonfiction and numerous works of translation. 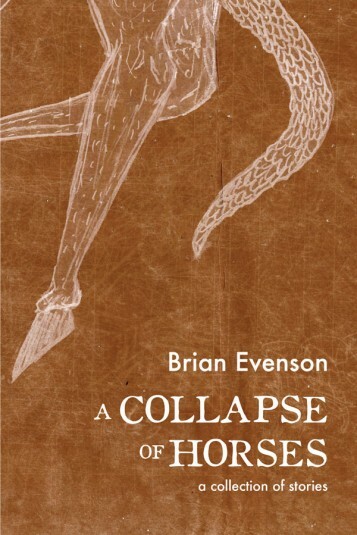 In A Collapse of Horses, Evenson’s stories, either vaguely or directly, contain homages to some of horror’s most well-known writers. The first and last pieces in the collection, for instance, immediately create an atmosphere of Cormac McCarthy-esque violence and carnage. In the first story, “Black Bark,” a pair of outlaws flees from a group of unidentified assailants. Sugg, one of the protagonists, limps as his leg weeps blood, the two men trudging through the mountain wilderness. At a certain point, Sugg vanishes, leaving Rawley, the other main character, alone in the forest. Upon Sugg’s mysterious return, there is a distinctly malevolent shift to his nature, though to name this malevolence specifically would give away the ending. “The Blood Drip” depicts two male protagonists as well, with Karsten leaving his friend Nils for dead after Nils is hit in the head with a stone, skull showing through his peeling scalp, reminiscent in its gore of Cormac McCarthy’s Blood Meridian. Karsten, like Rawley in “Black Bark,” traverses into the cruel, barren wilderness alone, singeing his hair and blistering his fingers when he accidentally falls asleep by the fire. Of course, Nils eventually finds Karsten, the former covered in blood, and similar to Sugg, there is something unsettling, something malignant in his return, though again, to reveal any more would spoil the story. In contrast, stories like “The Punish” and “Any Corpse” are more suggestive of Poe in their morbidity and circularity, delving into the macabre. In “The Punish,” a series of dares between two boys escalates out of control, with the theme of vengeance similar to that of Poe’s “The Cask of Amontillado.” And in “Any Corpse,” there exists a dystopic world of raw flesh showering down from the sky that is collected by the furnishers, the ones who handle the collection and distribution of said flesh: “what seemed fresh and unmaggoted and was large enough to grasp they gathered…what was rotten they kicked dirt over, lifting their faces to the sky as they scraped the dirt along with their feet.” If one is in need of a fresh corpse, the furnishers are the ones to ask—however, if you tell them that “any corpse” will do, be prepared for the potential consequences. The prison-minded story “A Report” is dedicated to Jesse Ball. In particular, the story draws many parallels to the themes explored in Ball’s novels The Curfew and Silence Once Begun, in which Ball interrogates the arbitrary injustices often inherent in systems of authority. In “A Report,” a man is imprisoned for undisclosed reasons, and his jailers are inclined to torture. But it is the seeming randomness of who they choose to punish that is the most petrifying element of the story—it is the anxiety of not-knowing that gets under his readers’ skins, similar in its effect to how Ball troubles the rules of cause and effect, of actions and consequences in his own work. “BearHeartTM,” “Click,” and the titular story, “A Collapse of Horses,” are other standouts in this collection. Though “BearHeartTM” has a George Saunders-like premise—a husband and wife decide to purchase a teddy bear with their unborn daughter’s heartbeat implanted inside—where Saunders would execute the concept with humor, satire, and the absurd, Evenson takes the story into the realm of the uncanny and the terrifying. “Click” and “A Collapse of Horses” are representative of the book’s most prominent theme and question: the exploration of the reliability of perception, memory, and the very notion of a fixed, stable reality. In “Click,” a man who has experienced head trauma may or may not have committed some atrocious crime. It is unclear whether he is crazy or sane, if he is in a hospital, if indeed he is having conversations with lawyers, doctors, and policemen—or if none of the things are true. Those familiar with Charlie Kaufman’s films will appreciate where Evenson ultimately takes this story. Finally, in the title story, an unnamed narrator who is forced to stay home due to an injury at work becomes obsessed with a group of horses lying down in a nearby field. He is unable to tell if the animals are breathing. Parallel to this obsession, the narrator “would awaken each day to find the house different from how it had been the way before.” He becomes increasingly unsettled by his inability to truly know the truth, the reality, of either situation, whether the horses are dead or alive, whether the house is transforming. Evenson asks of his reader: how much can any of us in this world really know anything? It is unsurprising that Franz Kafka, Jorge Luis Borges, and Robert Coover have all been named as influences on Evenson. Like these authors, Evenson has realized that the utter inability to find answers and to make sense of our own existence are perhaps the most horrifying prospects of all. Whether you decide to call the book by its given title, A Collapse of Horses, or by my malapropistic substitution of “horrors” for “horses,” most importantly, you should buy this collection as soon as possible. Be warned, though—if you’re prone to nightmares, perhaps do your reading with a cup of coffee in the morning.